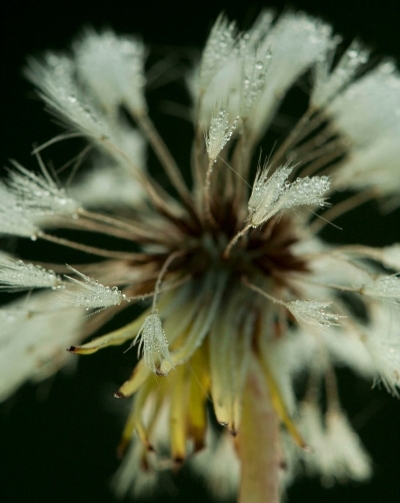 Frost covers a dandelion seed head. Plants have evolved in ways that help them deal with cold conditions. Knoxville, TN - Researchers have found new clues to how plants evolved to withstand wintry weather. In a study, which appears in the December 22 issue of the journal Nature, the team constructed an evolutionary tree of more than 32,000 species of flowering plants - the largest time-scaled evolutionary tree to date. The researchers then combined their evolutionary tree with freezing exposure records and leaf and stem data for thousands of species. In so doing, they were able to reconstruct how plants evolved to cope with cold as they spread across the globe. Fossil evidence and reconstructions of past climatic conditions suggest that early flowering plants lived in warm tropical environments, explained co-author Jeremy Beaulieu, a postdoctoral fellow at the National Institute for Mathematical and Biological Synthesis (NIMBioS) at the University of Tennessee, Knoxville. Unlike animals, most plants can't move to escape the cold or generate heat to keep them warm. It's not so much the cold but the ice that poses problems for plants. For example, freezing and thawing creates air bubbles in plants' internal water transport systems, which can block the flow of water from the roots to the leaves killing the plant. Some plants, such as hickories and oaks, avoid freezing damage by dropping their leaves before the winter chill sets in - effectively shutting off the flow of water between roots and leaves - and growing new leaves and water transport cells when warmer weather returns. Others die back to the ground in winter and re-sprout from their roots or start growing as new plants from seeds when conditions are right. "This suggests that some other environmental pressure – possibly drought - caused these plants to evolve this way, and it happened to work really well for freezing tolerance too," said co-author Amy Zanne at the George Washington University. The only exceptions were plants that shed and replace their leaves seasonally - these plant groups didn't gain the ability to drop their leaves during winter until after they encountered freezing, Beaulieu added. Also co-authoring the study was Brian O'Meara, a member of NIMBioS' Affiliate Faculty and assistant professor in UT's Department of Ecology and Evolutionary Biology. The tree, data and source code are freely available online in the Dryad digital repository at http://dx.doi.org/10.5061/dryad.63q27 and in the TRY plant trait database at http://www.try-db.org. You can also explore the tree at http://www.onezoom.org/vascularplants_tank2013nature.htm. Guardian Express: Plant evolution study shows how some plants prevent freezing. Business Standard: Largest evolutionary tree of flowering plants mapped. International Science Times: These three coping mechanisms help deal with cold weather.